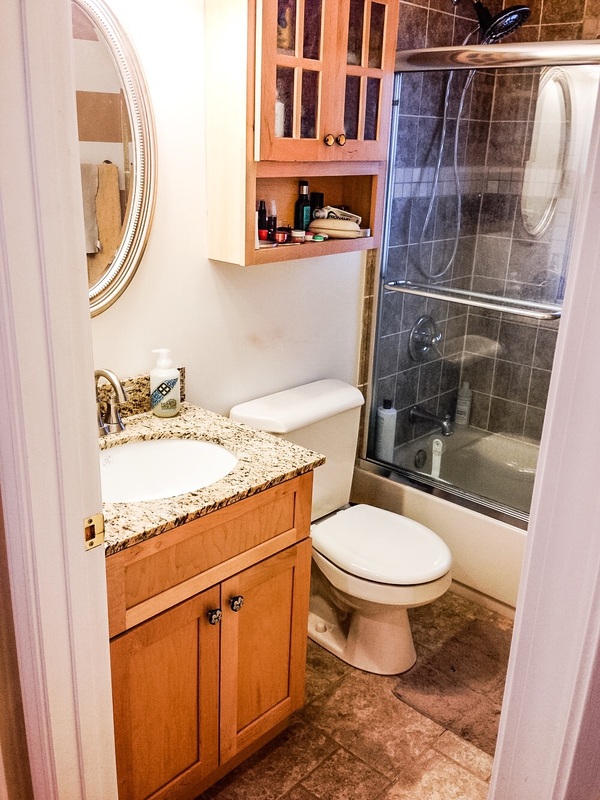 My husband and I do not share a bathroom - I am very grateful for that! However, I don't understand how I could share my bathroom with anyone - mine is so small! In the original bathroom, there was nothing too offensive about it, but it definitely did not suit my taste. There was a lot of brown. Brown tile everywhere! I also used to have glass shower doors. I have a love/hate relationship with glass shower doors. 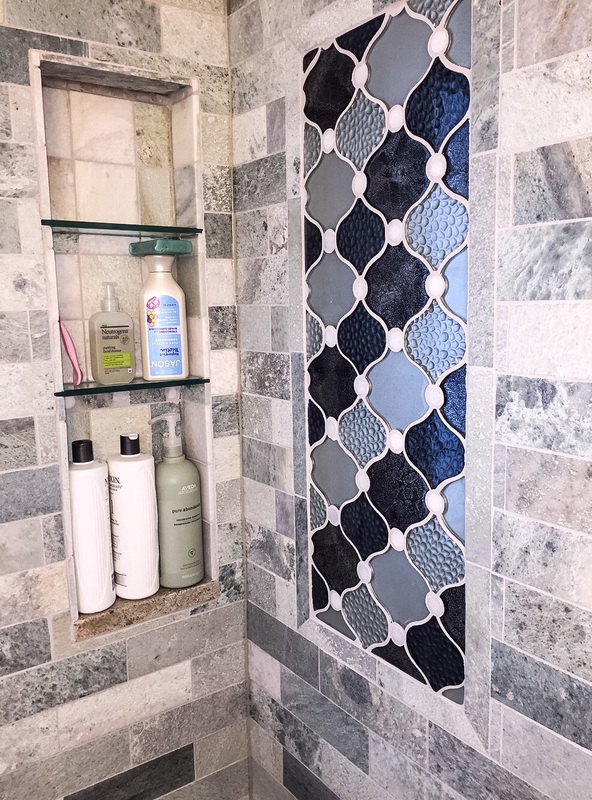 The Pinterest girl in me loves glass shower doors. But the real me - the one that cleans them - hates them! One major downside that I have is that I have an issue with cleaning. I'm not good at it, at all! I felt that the glass shower doors had to go. 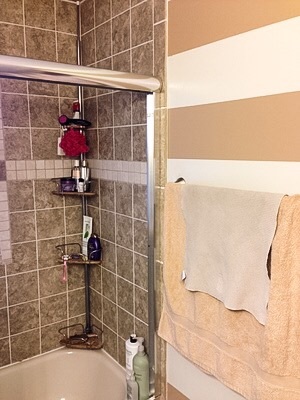 I wanted a curtain since I was sure I could keep that set up looking nicer than the glass shower doors. After - love this marble! I also have this obsession with small floor tiles. I am not a big fan of the larger pieces in a small bathroom area. I wanted light colored honey comb tile. The vanity needed an upgrade - and I was interested in having a vessel sink. I talked to my husband about my design ideas, and he was on board with the project. It was winter when we were about to start this project, but I had a 4 day work trip that would allow for him to do the majority of the work (it's so nice to be married to a handy-man!). Winter was a factor because another thing that he was going to fix was the window in my shower. The old window was made of wood. I'll give you a guess of how well having a wooden frame in a shower went. It was not good! The plan was to switch it out with a glass block window. 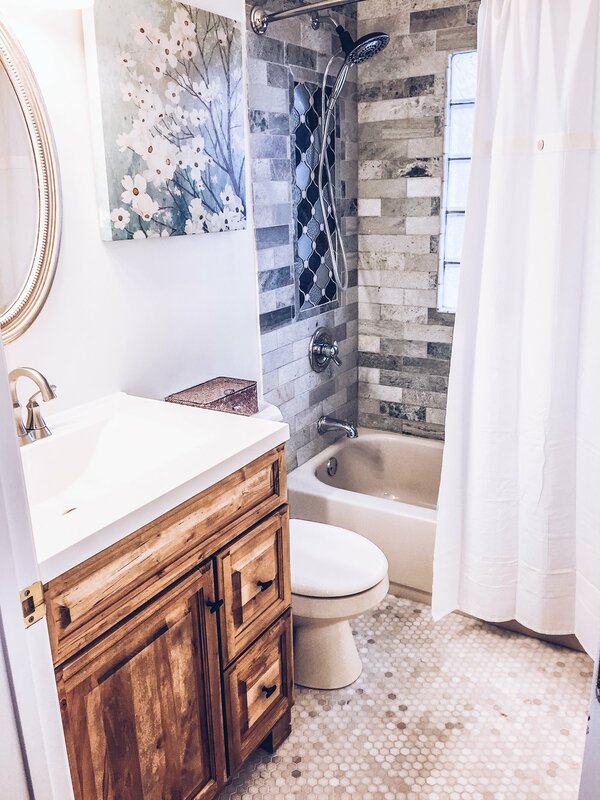 We had been talking about doing this bathroom remodel for a while now, so I was very excited to get started! We headed down to the tile store and made my selections. We went with a Caribbean Marble for the shower with a glass tile design detail, and I found the perfect honeycomb floor tile. We then headed down to the Home Depot and picked out a new vanity and vessel sink. I did not need new fixtures since I had already upgraded what I had the year prior. We were all set! All went smoothly with the project, and the whole thing was complete in it's entirety in about two weeks. We are planning to move to a new home within the next year or so, but I am so glad we remodeled when we did so that I could enjoy the new space for a few years.